Alan Moore, the bearded demi-god wizard of Northampton and critically acclaimed writer of far too many things to list here, is set to return to comics writing a new 6 issue limited series for publisher Avatar. 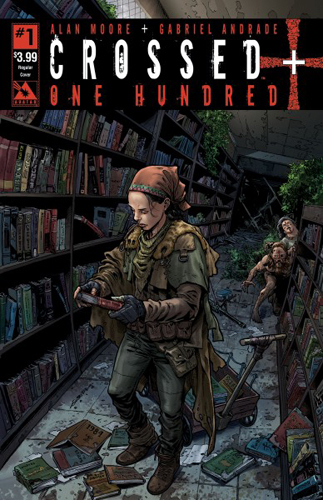 The limited series called “Crossed: + One Hundred” will be the latest incarnation of Avatar’s hit horror series which has become notorious for its vision of a nightmarish world that makes The Walking Dead look positively cheery. This time things will have a twist with the series being set one hundred years from the original outbreak of the Crossed. The idea for the limited series spun out from conversations between Moore and creator of Crossed Garth Ennis about the possible future for humanity in the world of the Crossed. As a result Moore has created a new history for the world exploring what happens to the Crossed and humanity. The story will focus on an enclave of survivors most of which have never seen an infected member of the Crossed in a world where nature has reclaimed the cities formerly inhabited by man. Future Taylor, an archivist with an interest 20th and 21st century science fiction who heads up a struggling team of reclamation workers, is one of the main characters of the series. When the team stumble upon a small group of the Crossed the team are worried about the violent nature of the infected and the implications they have on their future survival. As well as writing the self contained story, Moore has also designed the covers for the series, with numerous variants tying into the themes of the story and showing glimpses into life in this future world. Crossed: + One Hundred is set to appear in December. The League of Extraordinary Gentlemen heading for TV screens.